The babe’s 2nd birthday was earlier this week but we’re celebrating this weekend and I *think* he understands what’s going to happen based off of his brother’s recent birthday. I’ve told him a few times it’s almost his birthday and he literally squeals and yells, “YES!” When I ask him if he wants chocolate cake he gives another emphatic “YES!” Annnnnd the same if I ask him if he wants a vanilla cake. So, maybe I’ll nix both flavors and just make a pumpkin carrot cake because the whole family is obsessed with that! The one thing I know for sure? The “theme” of his party will be puppies. I’ve never seen such a little kid SO obsessed with animals; he goes crazy around just about any animal, but especially around puppies. His grandma has the cutest little puppy that I’m certain is his best friend (after me of course ;)). He also thinks his animals need milk and food, so he’ll “feed” them resulting in no short of a ridiculous amount of messes. Usually whatever we make him for breakfast, lunch, and dinner also gets fed to whatever animal(s) he’s lugging around at the time. 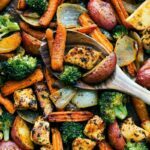 This sheet pan dinner has become one of our new favorites and it’s perfect for the cooler weather with the heartier root veggies. Lucky for me, my husband hates onions, so I get a double helping of them and they are actually my favorite part of this dinner! They get slightly caramelized and are so full of flavor! At the end of the baking time, you’ll broil the sheet pan on high for a couple of minutes which gives all the veggies and the chicken a nice char. The cook time of this dish is staggered to ensure each of the veggies are at optimal tenderness and the chicken doesn’t get overcooked. The first batch of veggies are cooked for 20 minutes and then you’ll add the broccoli and the chicken to the sheet pan and finish cooking. 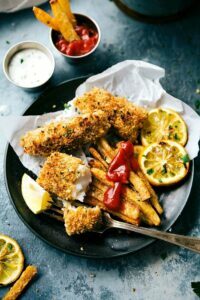 It’s such an easy dinner to make and one the whole family will enjoy! OR if you want to keep this all for yourself (and trust me, I do not blame you!) it makes a great, super healthy meal prep option! Dab the chicken breasts with paper towel to dry. Remove any fat and then chop the chicken into 1/2 inch pieces. Place in a medium sized bowl. In a small bowl, combine the parsley, oregano, garlic powder, onion powder, paprika, seasoned salt (to taste; I use 1/2 teaspoon), and pepper (to taste, I use 1/4 teaspoon). If desired, mix in the 1/4 teaspoon red pepper flakes. 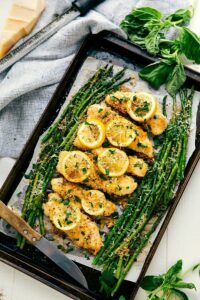 Stir to combine and then take half of the seasoning mix and add to the chicken with TWO tablespoons olive oil and the zest and juice of 1 lemon. With your fingers, toss the chicken, olive oil, lemon, & seasoning mix until the chicken is well coated. Cover and place in the fridge for 30 minutes (while everything else is being prepped and cooking). Preheat the oven to 425 degrees F. Line a very large baking sheet with parchment paper for easy clean-up. Halve the baby carrots lengthwise, Halve the baby red potatoes (or quarter for large ones), and coarsely chop the onion (halve it, halve each half, and then cut each half into 2 or 3 sections -- see pictures for general size). 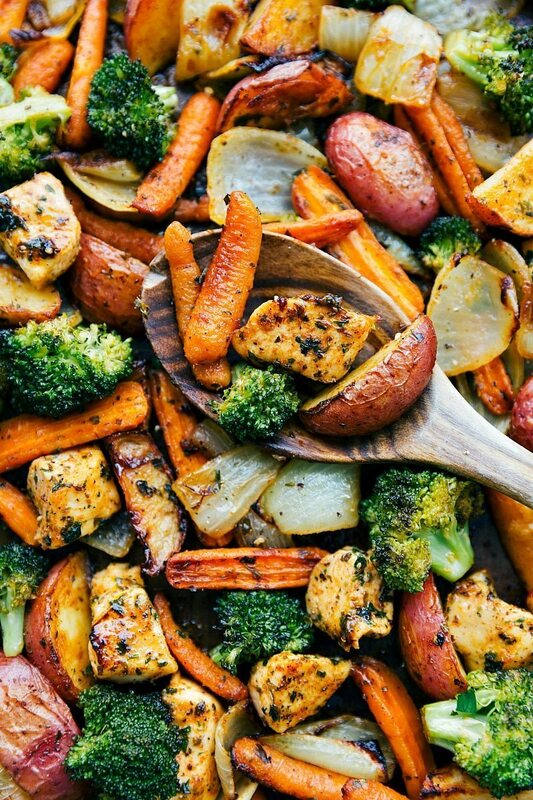 Place the carrots, red potatoes, and onion on the prepared sheet pan. Add another 2 tablespoons olive oil and most of the remaining seasoning mix (leave 1 teaspoon). Toss with your hands to generously coat everything and place in the preheated oven for 20 minutes. Meanwhile, chop the broccoli into bite-sized pieces. 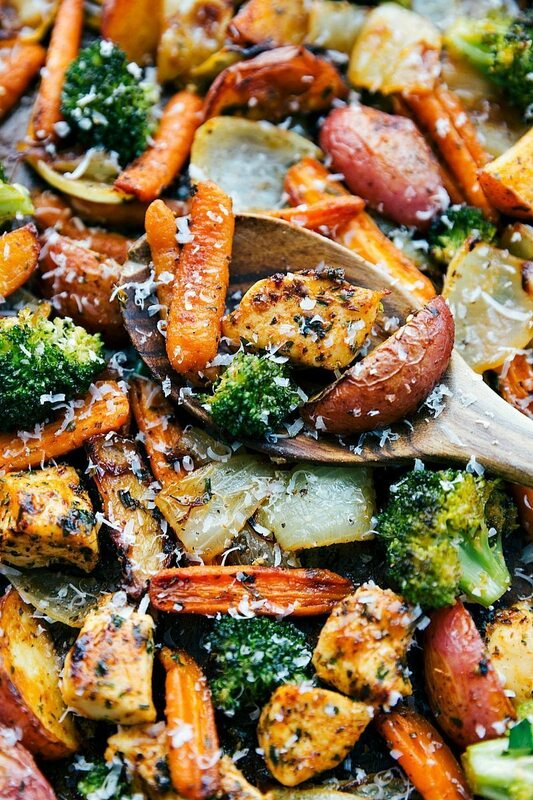 Remove the pan from the oven and toss the veggies and section them off to one half. 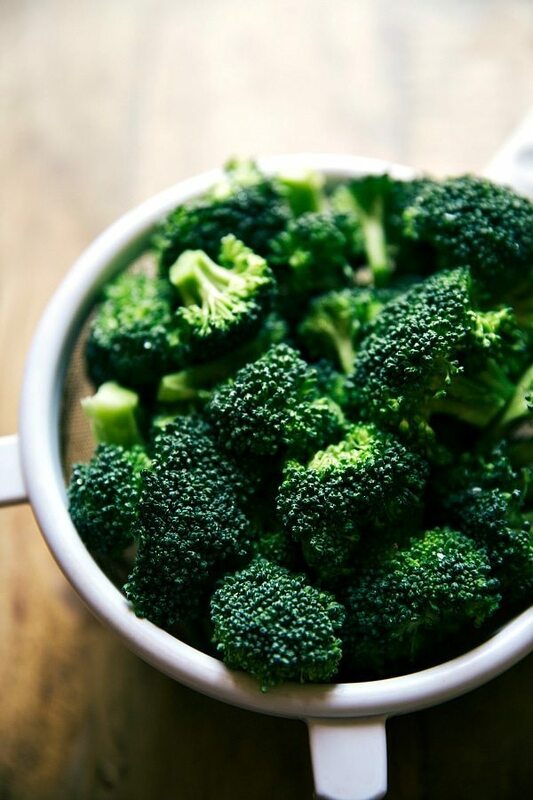 Add the broccoli and minced garlic to the other half and toss with the last tablespoon olive oil and last teaspoon of seasoning mix. Toss to coat and then toss the broccoli with the other veggies and section to one half of the tray. Remove the chicken from the fridge and drain off ALL the liquid (I like to pick up the chicken with a cupped hand and shake it off a few times). Add to the sheet pan and ensure the chicken pieces are separated (not on top of each other) so they can fully cook. Return to the oven and cook for another 15-20 minutes or until chicken registers 165 degrees F and vegetables are to desired tenderness. While the sheet pan is in the oven, change to a HIGH broil and cook for 1-2 more minutes (adds a nice char :)) Watch it carefully to avoid burning. Remove from the oven and top with freshly grated Parmesan cheese and enjoy immediately or use for meal prep. To meal prep: prepare 1 cup uncooked quinoa or rice according to package directions and then separate it evenly into 4 separate containers. Place an even amount of the sheet pan dinner into each container. Cover and place in the fridge. Enjoy by warming in the microwave. I haven’t got parmesan but do have a grated Italian blend with parmesan in it. Will this work? Yes that will work great 🙂 Enjoy! hey girl- Happy Birthday to your little guy! This looks so yummy! Made this last night, very yummy. Totally forgot to buy a lemon so I used a little balsamic instead. One question – you’ve got minced garlic in the recipe but I don’t see where it’s used? Did I miss it? So sorry! You add it with the broccoli 🙂 I hope you love this dinner! This is our dinner tonight. It was really yummy. My husband and toddler both love it. Thank you so much for sharing your family’s recipe. Did a quick google search for a meal with chicken and veggies to bake, and this popped up. I read through the ingredients, and had most of them. Let me just say, I was not expecting it to be as good as it was. Not that I thought it would be gross, I knew it would be good, but it was AMAZING! Maybe the smell of the spices turned me off while cooking. WE didn’t have carrots, so I used asparagus instead. My kids were complaining about all the veggies on their plate, and once they started eating everyone was happy. My husband says it’s one of the best meals we’ve had in a while. Thank you so much Chelsea! It was easy, and I will likely be making this weekly. Best family dinner we’ve had in a while. 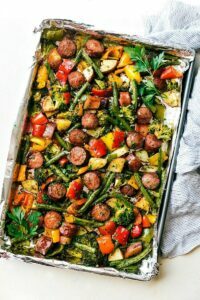 If you are doubling this sheet pan recipe and using two sheet pans, should you cook it on a higher temp and or longer? Have you tried this before? I followed it exactly, and it did come out delicious. Best if right out of the oven, and since my husband came home late, it wasn’t as great after left in oven on warm for an hour. I won’t make it again, only because it took much longer in prep than I anticipated, and although it used one pan to cook, there was a lot to clean up afterwards. The suggested parchment paper lining didn’t work well as it moves around too much when tossing. I will be looking for less prep recipes in the future for weeknight meals. Thanks for your feedback Barbara! I asked my husband what he wanted for dinner, he said something simple like a one pan chicken and veggie meal. I googled exactly that and found this recipe. I’ll never look back! 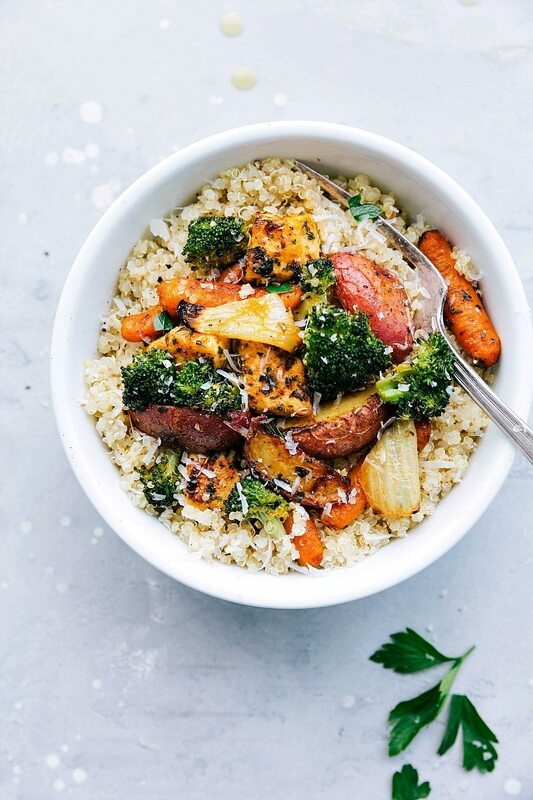 This recipe has reinvented the boring dinners I had made when attempting to eat healthy and make a one pan meal with veggies that I had seen several other times. The thing that was missing was all of the spices together. I thought i was pretty ok at seasoning my food until I made this. This meal is a staple in my household now. We do not do the onions because my husband doesn’t like them and we also do not do the minced garlic because I kept forgetting and then decided the recipe was amazing without it. My husband usually prepares the rice, and one time he put the Parmesan cheese into the rice instead of on top, and we’ve never looked back. 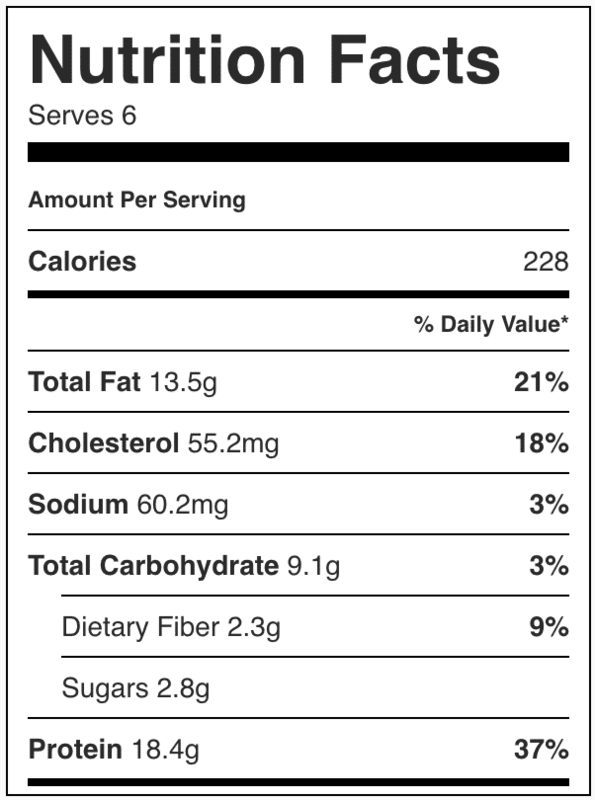 Obviously that is more calories, but it’s too good to pass up. I also want to note that I’ve brought leftovers to work and had several people mention the aroma. And I had a few visitors in my cubicle. I’ve given the recipe to two people as well. Ahh this made my day! I am sooo happy you guys enjoy this so much! It’s a staple at my house as well. Thank you so much for your comment Rebekah!! So, when you section the veggies in half, add the broccoli to the other half, and then mix the broccoli with the veggies and put the chicken on the other 1/2, the chicken is actually cooking along side the veggies and not mixed together, right?